A porous chemically modified photopolymerized sol-gel (PSG) monolith enhanced the capillary electrochromatographic separations of two test mixtures, one containing eight alkyl phenyl ketones and the other containing thiourea and three polyaromatic hydrocarbons. Derivatization of the PSG surface with silane coupling reagents resulted in bonded phases of pentafluorophenylpropyldimethyl, pentafluorophenyl, 3,3,3-trifluoropropyl, n-octadimethyl, perfluorohexyl, and aminopropyl. The fabrication of the bonded-phase PSG column is easy to do with the silanization reaction proceeding at room temperature for not longer than 60 minutes. 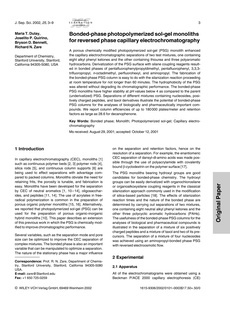 The hydrophobicity of the PSG was altered without degrading its chromatographic performance. The bonded-phase PSG monoliths have higher stability at pH values below 4 as compared to the parent (underivatized) PSG. Separations of different mixtures containing nucleosides, positively charged peptides, and taxol derivatives illustrate the potential of bonded-phase PSG columns for the analyses of biologically and pharmaceutically important compounds. We report column efficiencies of up to 180 000 plates/meter and retention factors as large as 28.6 for decanophenone.